Description: Guajuvira is a very durable, hard and resilient wood species (Patagonula americana) with a distinctive contrast of dark and light coloration that makes is the perfect choice whether for a rustic look or high end contemporary. Native to Brazil, Argentina and Paraguay, Guajuvira’s coloring consists of white to brown hues in the sapwood and many shades of dark browns and almost black hues in the heartwood. Its grain is a mix of irregular patterns and straight grain and finishes with a satin smooth luster. The wood is moderately photosensitive, will patina slightly as it ages. More Info: Guajuvira, which is also commonly referred to as Brazilian Hickory, Brazilian Pecan, and Macchiato Pecan, is a stunning variegated species that grows throughout Paraguay, Bolivia, Uruguay, Argentina, and parts of Brazil. The species has a hardness rating of 1810, which is almost identical to North American Hickory. 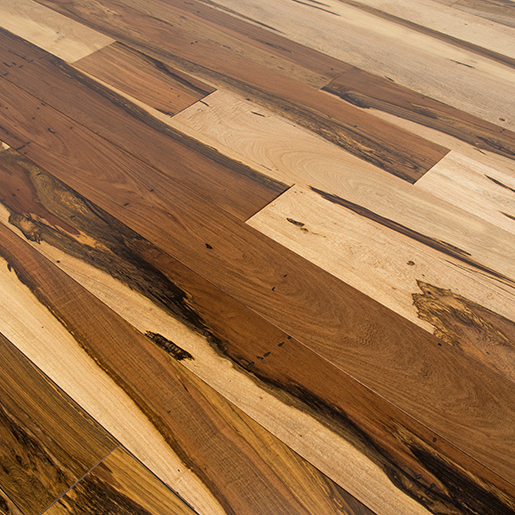 The wood also has a moderate stability rating very similar to Brazilian Cherry. Admittedly, Brazilian Hickory is a little wild visually, but it’s also very unique & very beautiful. In many instances a species like this will get pigeon-holed into a rustic classification, which it’s definitely suited for, but that only limits its potential. Guajuvira, in our opinion, will look just as dramatic in a contemporary high-end condominium or suburban home as it will in any mountain lodge.